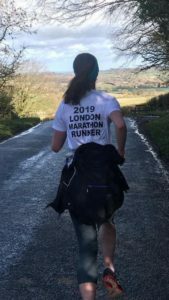 On 28th April, I will be running roughly the equivalent distance of one of CHN nurses’ rounds – 26.2 miles, at the London Marathon! Having won the place in a competition run by the charity in collaboration with Freestyle 360 gym in December, I have been training hard and am pleased with my progress so far. The Blockley-based gym put together a rigorous training plan and have been providing free Personal Training sessions and classes for me, as I’m a first-time marathon runner. They’ve offered so much advice and encouragement they’ve been brilliant. I ache after every PT session, but I feel much stronger and know I’m running better for it. Thanks to them, I’m beginning to feel quietly confident and excited about the challenge. 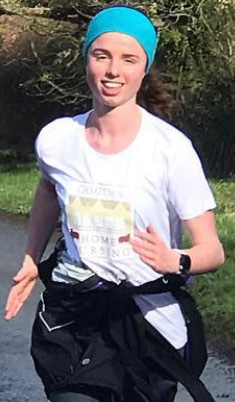 I was already determined to run well in London next month; the Doran family have benefited from the care provided by Campden Home Nursing first hand. When the charity was very new, the nurses cared for my father’s first wife, Josephine. I know that her having the option to live out her last days at home rather than in hospital meant a lot to Dad. More recently the charity helped care for my grandmother, Vera Doran. Having someone come in and check everything was okay took a lot of pressure off the family, they (the nurses) were truly wonderful… knowing that I’m running to raise money for them to continue their great work will keep me focussed on the day. I am aiming to raise £800 for Campden Home Nursing. If anyone would like to support me, please go to https://bit.ly/2U0l7qP where you will be able to make a donation. 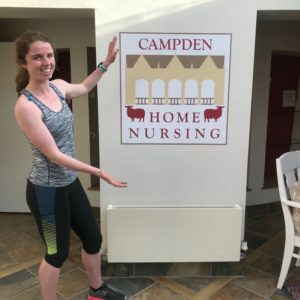 From all at Campden Home Nursing – good luck Frances, we’ll be cheering you on every step of the way!